What should we be aware of and why is it important? 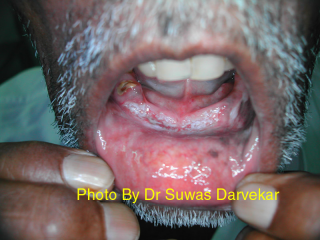 Oral cancer is defined as cancer of the lip, mouth or tongue. It can be a devastating disease. In India it is one of the most common forms of cancer, accounting for between 30% and 40% of all malignancies (higher than in other parts of the world). Although the prognosis can be good if spotted early, the majority of those with the disease are diagnosed too late. This type of cancer is very malignant, meaning that it can spread quickly if not treated early. People are dying because of lack of awareness. Many types of mouth cancer are preventable by avoiding the known risk factors. It is also possible to spot signs of early signs of mouth cancer or conditions that can lead to cancer by regular, thorough mouth examinations. If people are aware of the possible signs and symptoms they can be alerted to see a dentist or doctor as soon as they spot these. The earlier a lesion is diagnosed and treated the better the outcome. Tobacco use has been shown to be the biggest risk factor for developing mouth cancer. Tobacco contains carcinogens (substances directly involved in causing cancer) and causes approximately 85% of all cancers of the head and neck. Tobacco is a risk factor whether it it smoked or chewed. One of the reasons for the higher incidence of mouth cancer in South Asia is the widespread use of tobacco in paan, gutkha or betel quid. These are typically kept in the cheek and chewed or sucked for some time. Oral cancer can start in the floor of the mouth, gums, lips, inside the cheek or on the tongue or palate. Some cancers may start as “pre-malignant lesions” – these are areas which have a risk of developing into cancer and so need to be monitored. A white, red or speckled patch which cannot be rubbed off These are usually not painful in the early stages. If you have any of these, it doesn’t necessarily mean you have cancer. It just means that you should get checked by your dentist or doctor. They will either be able to reassure you, or arrange for further tests if necessary. Regular check-ups with your dentist will enable them to examine your whole mouth (not just your teeth). No one wishes or expects to get cancer but if early signs are seen, treatment can be far easier and more successful than if cancer is diagnosed at a later stage.